For most broadcast professionals buying storage is like buying life insurance: both are unloved, both are a necessity – and in both cases wrong decisions aren’t discovered until it’s too late. When purchasing storage, broadcasters unfortunately often make bad choices. After investing in expensive solutions from reputable storage companies, they discover that traditional manufacturers don’t understand broadcast and high-bandwidth multimedia environments. The new just:store honors the needs of professional broadcast with its new interface, higher performance, better hardware and more storage at an unbeatable price! Professional broadcast places unique demands on a storage solution. Speed and reliability are just starting points. Low latency, file-level access, consistent bandwidth and easy scalability are mandatory. Until now fulfilling these requirements at an acceptable cost was a daunting if not impossible task. ToolsOnAir understands broadcast and we understand value for money. just:store is the first storage solution built by broadcast professionals for broadcast professionals. Starting at 24 TB (4-bay) and scaling up to 192 TB (24-bay) per chassis we offer a solution to fit every need and every budget. All our systems support an unlimited number of clients and come with a five year hardware warranty. Bandwidth Profiles: select the Profile which works best for your environment (Playout, Editing, Ingest). EA Management: just:store takes care of filesystem operations to avoid extended attributes and access issues that could interrupt operations. TOA Broadcast Suite Integration: just:store seamlessly integrates with just:play, just:live and just:in. TOA Caching Engine: just:store goes further in the QoS for media jobs. The smart Caching Engine manages the different layers of the disk controller, operating system and network interfaces – ensuring reliability and performance for your tasks. Improved Project Handling: The classical Project handling approach allows you to save Projects anywhere on your just:store. You can now open the same Project in as many places as you want. Select Playout and just:store prioritizes clients requesting files to read. Write operations will be of secondary importance. Select Ingest if you need a capture process which is unaffected by any other read or write operations on the just:store system. Select Edit if you want equal priority for read and write requests. just:store fits on your specific network environment. You can either direct connect the clients or use a switch. Also it is possible to set Bonds. 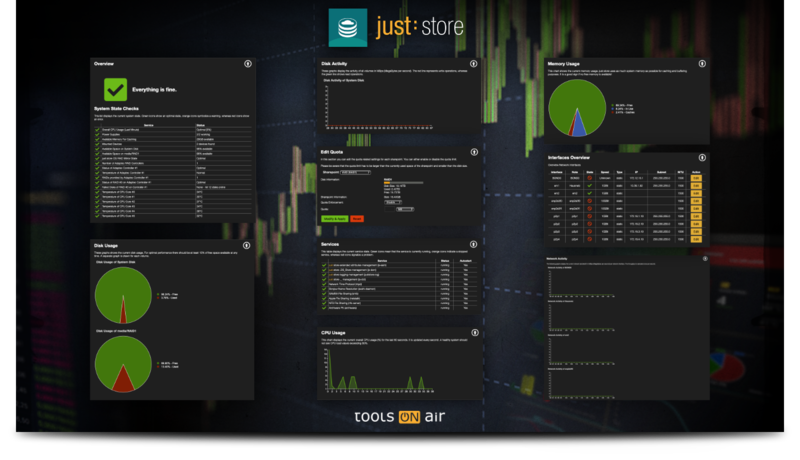 just:store is flexible with network environments to fit in every environment.